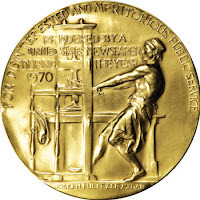 A Follow Spot: Pulitzer Prize Awarded to "Next to Normal"
(1) The Board did attempt to vote on the three nominees, but none received the required majority vote. It was at this point that they moved to consider other possibilities. (2) I can't at the moment track the source for this, but the nominating jury apparently did mention "Next to Normal" in its statement, in an "also considered" context, though it did not in the end make it one of the nominees. Brantley's idea that the Pulitzers for drama represent "solid bourgeois tastes" is probably close to the truth, though as he notes the award did go appropriately to "Streetcar," "Long Day's Journey," and Part 1 of "Angels in America." The list of 8 musicals (as I mention in my course) are certainly an oddly assorted bunch, and good as they are nobody would say that they're the 8 best musicals dealing with American life. ("Fiorello" is largely, perhaps unjustly, forgotten, and "How To Succeed..." is fun but not really a prizewinner for the record books (even Loesser himself rolled his eyes about winning for that rather than "Guys and Dolls" or "The Most Happy Fella"). Still, it's always a matter of what's there to consider in a given year, and how the board feels about it. 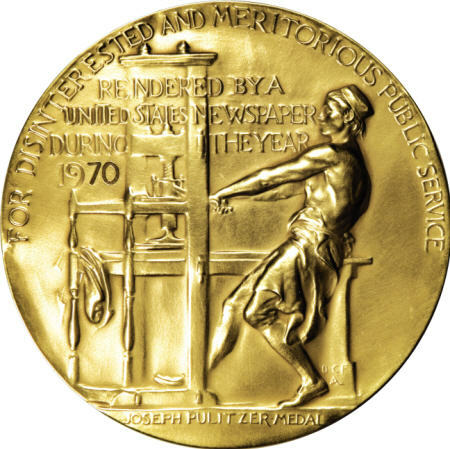 Or maybe we're all just making too much of the Pulitzer in general, and it really shouldn't be more than another "good for you if you get one/doesn't mean much if you don't" kind of kudo. Please forgive my typos and other issues while I am out of town and hobbled by other people's stuff and use of my Blackberry to do stuff for the most part. I believe Des calls those "tappos." That last is how I would always think of it anyway: so many worthy contenders have been overlooked in favor of what now looks like ephemera, I can't take it as an indicator of anything really significant, except that it's nice when it goes to someone good, even if for the wrong works. Look at the whole list of drama winners, I do see a few titles (beyond the 3 Brantley mentioned) that I have to trouble considering our very best: "Our Town," "The Skin of Our Teeth," "Death of a Salesman," "Picnic," "Talley's Folly," and it's probably too soon to talk bout the staying power of anything more recent. It's also interesting that, aside from perhaps 3 of the musicals, Drama in this case means Serious Drama. There aren't many (or any?) comedies on the list, though to me comedy can be as profound as anything. Even Neil Simon won it for his serious effort, "Lost in Yonkers." Some, certainly, do have their funny moments ("Angels in America" has plenty), but it's an interesting... what I would call prejudice. I am a bit overly excited by the Sarah Ruhl play...! "have NO trouble" in my last comment. Of course.